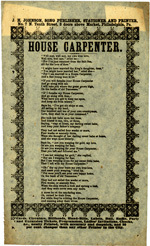 Song broadsides were a common and inexpensive medium through which popular songs were commercially disseminated prior to the advent of sound recordings. Song broadsides—also known as song sheets or slip ballads—typically consist of a single sheet of paper, approximately 6” x 9”, with the lyrics of a song printed within a decorative border. Since they nearly always contained only text and no engraved music, broadsides were cheap and simple to produce. 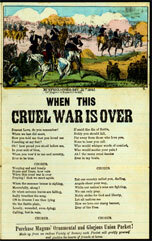 Many broadsides were text-only versions of popular songs that were also available in sheet music form from music publishers, but others contain songs that were published in no other medium. The Kenneth S. Goldstein Collection held by the Center for Popular Music consists of nearly 3,300 American song broadsides, from more than 120 publishers. While most broadsides carry no publication date the items in the Goldstein Collection range from the late eighteenth to the early twentieth centuries, with the bulk having been published between 1840 and 1880. The collection provides an exceptional window through which to view and study American taste and culture of the time. Numerous older traditional ballads were printed in broadside form, as were contemporary narrative songs that documented natural disasters, battles, political events, social movements, tragic accidents, and the concerns of daily life. Sentimental and comic songs were plentiful. The mission of the Center for Popular Music is to promote the study of American popular and vernacular music, with emphasis on the role of music as an integral part of American cultural and social history. These broadsides are historical documents. Many contain language and convey stereotypes that reflect the culture of a particular period or place in the past but that are regarded as offensive in modern times. They should therefore be viewed and studied in the context of theera in which they were created. They are presented as part of the historical record and do not necessarily represent the views of the Center for Popular Music or its staff. The digitization and cataloging of the Goldstein collection was supported by a Preservation and Access grant from the National Endowment for Humanities. Work on the project was carried out from July 2003 to July 2005. Any views, findings, conclusions, and recommendations expressed in or on this website do not necessarily reflect those of the National Endowment for the Humanities.